Tag Archive | "Loricaria sp. `RIO ATABAPO`"
The Crying Whiptail (Loricaria sp. `RIO ATABAPO`) is also known by tropical fish keeping enthusiasts as Loricaria Columbia or Colombian Loricaria (Loricaria sp. `Colombia`). The “Crying Whiptail” name is derived from the two black stripes that run on top of the head and through the eye of the fish that resemble large tears. Crying Whiptails are similar to Rineloricaria spp. but but are differentiated by their more feathered sucker mouths. This is more evident in adult specimens. The sucker lips of the male Crying Whiptail is always larger than those of the females. The species is easily identified by the two distinctive parallel black lines that start at the snout and end just before the dorsal fin. They have a black blotch on the dorsal fin that sometimes takes up the entire dorsal fin and runs down into the body. Two additional broad black lines are noted on the caudal penduncle with a single broad line in the middle of their caudal fin. Well conditioned adult fish usually display a filament on top of their their caudal fin. The Crying Whiptail was initially discovered in an unnamed river north of the town of Villavicencio, southeast of Bogota, Colombia however; the species has since earned its nickname (Loricaria sp. `RIO ATABAPO`) which suggests that it was found further east in the Rio Atabapo, Venezuela. This particular species is collected in a river that is only 5m to 30m wide, with rocks and a few sandy zones. Crying Whiptails are peaceful bottom dwellers that in their natural habitat, dig themselves into the sandy substrate of the river bottom. They are very peaceful fish, easy to keep, and should not be housed with any aggressive species that could outcompete them for food. In an aquarium environment, they require a long (4′ or wider) sparsely planted tank, with plenty of open fine sandy areas on the bottom for them to bury themselves. The tank should be aquascaped with a few river rocks and a piece of bogwood or two to mimic the river conditions they are found in. Crying Whiptails are mouth brooders which is why the lips of the males are larger than the females. The males care for their eggs by keeping them underneath their head, torso, and in their mouths. 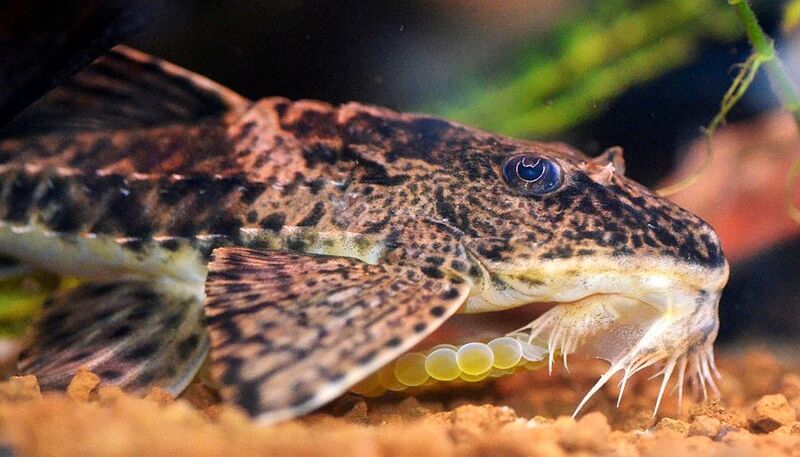 Females will usually deposit 60 – 100 eggs per spawning and the male will hold the entire clutch of eggs in their mouths at one time. The young will hatch out after 16 days. Raising the fry is not a problem with this species. They will eat tablets and brine shrimp as soon as their yolk sacs are absorbed. Crying Whiptails are easy to feed and will eagerly accept commercially prepared tablets, bloodworms , brine shrimp or other meaty frozen foods. Vegetables and algae are not on their diet. When available for sale, Crying Whiptails are usually 3″ to 4″ in size.